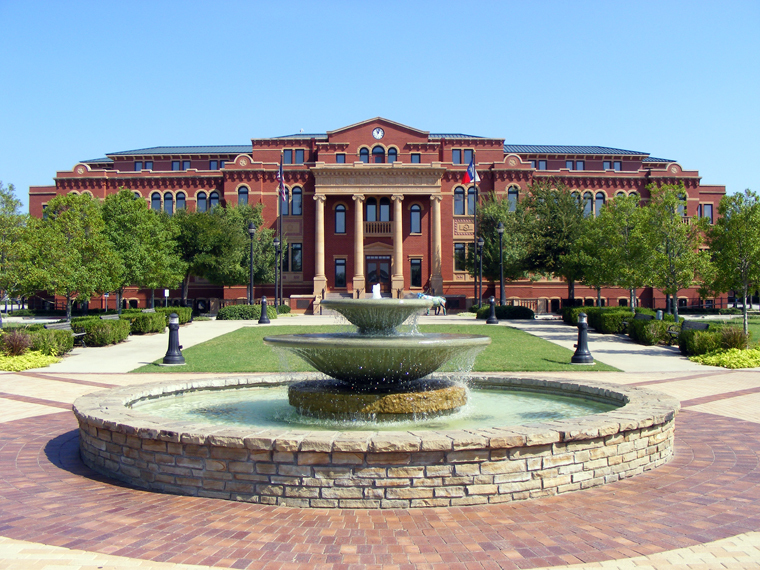 Southlake is a city located predominately in Tarrant County with areas that extend into Denton County in the U.S. state of Texas that is part of the Dallas - Fort Worth metroplex. As of the 2010 census it had a population of 26,575. Southlake is known for public schools, Southlake Town Square, its wealth, Gateway Church and Carroll High School's 8-time state champion football team. In the early 1990s when Southlake began developing master-planned neighborhoods, the minimum lot size was 1-acre (4,000 m2). Later the City of Southlake reduced the minimum lot size to 1/2 acre, and later 1/3 of an acre. These master-planned upscale neighborhoods began popping up all over the western portion of Southlake Boulevard. Some of the larger upscale neighborhoods developed in the 90's along Southlake Boulevard include The Hills of Monticello, Monticello Estates, Stoneridge Lakes, Myers Meadow, Stone Lakes, Timber Lake, Southridge Lakes and Timarron, which includes the Timarron Country Club. In the 2000s when the earlier neighborhoods were finishing out, Southlake began developing portions of its picturesque countryside into luxury neighborhoods. Some of the newer luxury neighborhoods include Clariden Ranch, Estes Park, Stratford Park, Cambridge Place, Shady Oaks, Westwick Hills, The Enclave, Laurelwood Park, Villas Del Sol, Palomar Estates, The Reserve of Southlake, Coventry Manor, and Versailles.